Last month, the CEB assembled a two-day meeting of “chief marketing technologists” from nine Fortune 500 consumer brands to have a confidential exchange among peers. I was the only outsider who was permitted to participate, as I facilitated the segment of their discussion around marketing technology stacks — in particular, exploring issues around single-vendor suites, open platforms, and point solutions. To me, the most interesting insights came from the graphic at the top of this post. 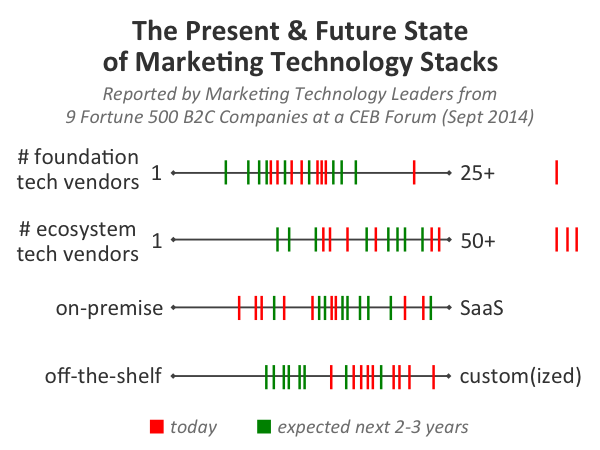 How many technology vendors are the foundation of their marketing technology stack, with a single vendor on one end of the spectrum and 25 or more on the other end. How many technology vendors are in their entire marketing ecosystem — including point solutions used by different groups across marketing — with a single vendor on one end of the spectrum (the hypothetical marketing technology nirvana some vendors are seeking) and 50 or more on the other end. How much of their software is managed on-premise vs. how much is provided in the cloud as SaaS (software-as-a-service). How much of their software is off-the-shelf vs. how much is either customized or built entirely custom from scratch. The red marks off the right-side of the scale for the first two questions were intentionally made by participants who exceeded the upper bound of my impromptu scale. These were not intended to be precise measurements, but simply ballpark estimates to illuminate general patterns. None of them expect to move to a single-vendor solution at their core. At least not in the next 2-3 years. However, most of them are looking to reduce the number of vendors in the foundation layer of their marketing technology stack — software such as CRM, CMS, MAP — to achieve greater standardization across the enterprise for core marketing data and services. But many expressed great wariness at becoming reliant on a single vendor. Almost all of them expect the ecosystem of more specialized marketing software at the layer above that foundation to remain rich and diverse. Again, the green marks relative to the red marks show that they expect greater standardization in those choices compared to the “chaos” of today — but they still expect 20-40 different vendors across the enterprise for an ever-evolving range of specific capabilities in the future. While there will be less purely custom-built marketing software, all of them still expect significant customization in their stacks. Most expect to customize and extend more off-the-shelf products, rather than building systems entirely from scratch. They’re expecting to leverage APIs almost like “private ISVs.” The most valuable kind of customization to them is that which helps differentiate their customer experience. Such customization is likely to be one of the key responsibilities for marketing technologists. Customer experience is increasingly the gravitational center of this mission. As such, it is viewed increasingly as an enterprise-wide mission, not merely a marketing mission — although marketing is largely in the driver’s seat. Change management with people and processes is by far a greater challenge than the wrangling of the technology involved. There is high variance in team structures and budget/funding models for marketing technology — but those management decisions are now being surfaced explicitly at a C-suite level. Most are moving towards tiered governance of marketing technology to better balance standardization and compliance with innovation and agility — with approaches such as the “bimodal organization” for IT shown in the Gartner chart below. Most are taking more control over data and platforms in agency relationships — through DMPs (data management platforms) in particular — but this is a huge subject that deserves its own post. The agency world is merely inches away from a major tipping point, in my humble opinion. Most expect to operate in a heterogeneous technology environment for the foreseeable future, but they’re imposing order to that “splendid diversity” by adopting dominant platforms as a foundation or building out an independent middleware layer (with the middleware approach seen as significantly reducing vendor dependency risks). The really exciting innovations in the consumer space are “digital in the physical world” — point-of-sale, beacons, personalized printing, out-of-home advertising, wearables, connected cars, etc. The future is closer than you think. Of course, this was only a sample size of 9, so this definitely wasn’t a statistically significant survey. But as an ethnographic study of how the marketing technology leaders of these nine major brands think, I believe it is a fairly realistic assessment of the true state of marketing technology. I have no doubt that the views expressed represent a pretty accurate picture of the top 3/4 of the pyramid of marketers. My concern is that the bottom of the pyramid, which is the largest number of enterprises, particularly manufacturers, probably numbering up to 50 or even a 100 employees. They simply (at least in Australia) do not have the depth of resources (money, time, capability) to stay on top of, let alone leverage this stuff as it emerges. So, the other emerging opportunity is for a standardised CRM, auto marketing, and transactional system to be constructed, probably from bits of existing packages, to be tailored to the needs of SME’s. Nobody seems to be doing that, although several I have looked at claim to be. Good point — this may be representative of large Fortune 500 consumer brands, but that’s not what most companies in the world are. It is an interesting question though, to wonder if what is happening at this larger brands is a precursor to a small scale model for others, or something completely different. Surprised not to see integration as an stated issue. Was this an understood issue that didn’t need to be stated? Great article, resonates a lot. Would be highly interested in a follow up blog about the role of agencies as you mentioned. Integration would be an interesting topic too, especially, as you noted, customer experience is now more an enterprise mission, which means deep integration with internal databases, processes, customer support etc. This quick study definitely mirrors what I’m hearing from our customers and colleagues. It will be increasingly important for vendors to understand the multi-platform world our customers are living in, and make sure that all of our systems and support reflect that reality (i.e., you will not be able to come in and “sweep the table,” you’ll need to prove that you can mesh in with the existing platform ecosystem within that organization). Thanks for sharing this information and insights Scott – and thanks to the F500 companies for providing you the opportunity. Although a small sample size, it is consistent with what I hear also. What a great piece (and spot on). Changes to the marketing function continue to be profound, and a complicated and overlapping slew of new technology solutions designed for marketing continue to come to market. Analysts claim that the CMO will soon be spending more on technology than their CIO counterpart. This is creating a large problem: a big-data for marketing problem where disparate data exists in silos all around the business. The center of the universe for a B2B marketer needs to be a platform that unifies all of the data from within the 4 walls of a customer and then continuously updates, enriches and appends that information so it may be accessed in real time by any system for any marketing purpose.